I have a couple Carbon Fiber Tripods and I tend to use the Carbon Fiber Tripods for not just hiking but all travel photo shoots where I am not tethering my camera to my notebook computer and or a monitor. For hiking, backpacking, trekking and any other outdoor activity or travel purpose there is no better tripod for those purposes than one made from Carbon Fiber. Fact: The Best Travel Tripods are Made of Carbon Fiber. Carbon Fiber is lighter than steel or aluminum. Carbon Fiber is also stronger than steel or aluminum. When tripod weight is a concern Carbon Fiber Tripod is the Best Solution. The only major drawback to carbon fiber is cost. 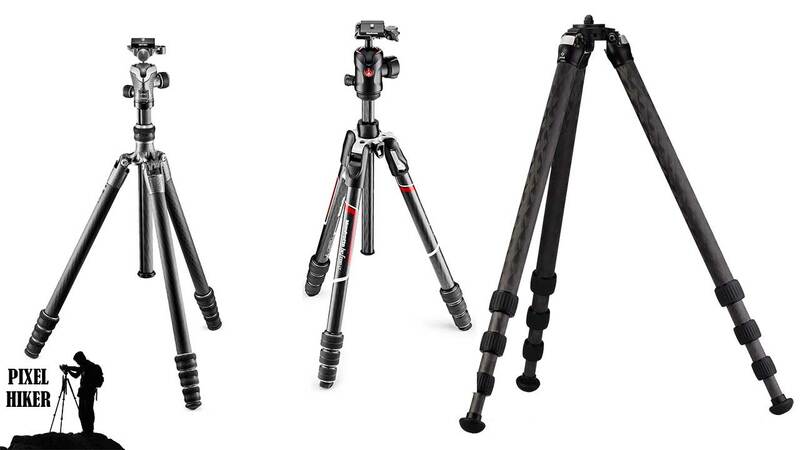 Typical Carbon Fiber Tripods cost 2-4 times that of their identical steel and aluminum counterparts. There is also usually a correlation between weight and cost. The lighter the tripod the more expensive it costs. Those few grams or ounces of weight savings can cost hundreds of dollars. When discussing the weight of tripods the weight may be for the tripod legs only or the tripod with the head. The weight of the tripod head can drastically alter the total weight of the tripod with the head. When selecting your Carbon Fiber Travel Tripod understand the total weight! All Carbon Fiber Tripods are not created equal. Like anything else you buy there are several considerations beyond tripod weight. There have been times I have used my Aluminum Manfrotto BeFree Tripod simply because it fit in a bag that my Manfrotto MT190CXPRO4 Carbon Fiber Tripod was to long for. Maximum Height: the tripod needs to extend high enough to suit your needs. This is typical determined by the number of leg sections but even tripods with the same number of leg extensions can be substantially different heights. Folded Diameter: You might need to fit your tripod inside a specific bag, pack or case and folded diameter can become a critical dimension. Folded Length: Similar to diameter length does matter, folded length that is especially important when stowing a backpack. Don’t buy excessively more tripod than you need: If a Carbon Fiber Tripod with a 15 pound capacity is suitable start there. You don’t need to spend hundreds of dollars more on a higher capacity model unless you want to. My list of the Best Carbon Fiber Travel Tripods 2019 is a culmination of hands on experience and internet research. I couldn’t afford to own them all let alone buy the most expensive models on the list. I’m guessing other lists are compiled the same way. I also tried to include tripods for every budget, again you typically get what you pay for. I’m a Manfrotto guy. When all else fails and your unsure what to get, buy a Manfrotto and you won’t be disappointed. 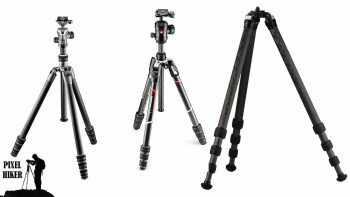 Manfrotto also distributes Gitzo tripods. When looking at these tripods some have special features that might be useful. Some can get lay flat and get within a couple inches of the ground. Others have a center column that can go horizontal for taking pictures straight down. One tripod in that list actually can convert to a monopod. Next pass Ill will discuss the tripods in detail. This list below is sortable by any column criteria you choose as most important to your needs.